Mondo, in collaboration with Howe Records, announces three incredible Howard Shore scores from classic David Cronenberg films Naked Lunch, Dead Ringers and Crash. This continuation of Mondo’s Cronenberg series, which began with a soundtrack for Scanners and The Brood, features beautiful and haunting design work and marks the first time all three titles will be available on vinyl. Crash is the first Cronenberg film to premiere at Cannes. John Bender wrote “Shore’s calculated instrumentation, mostly electronically manipulated guitars, harps and percussion, give Crash a cold and burnished metallic sound.” The perfect companion to an uncompromising filmmaker like David Cronenberg. 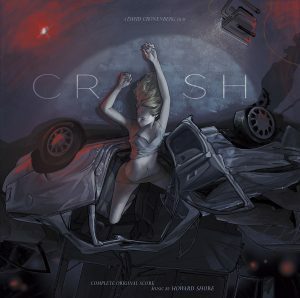 Celebrating the 20th anniversary of this complex film, Mondo and Howe Records are pleased to present Howard Shore’s score for Crash for the first time ever on Vinyl, with original artwork by Rich Kelly. © 2016 Howe Records, LLC. All Rights Reserved.